Samsung’s Galaxy S4 Google Play Edition(GPE) just got the Android 5.0 Lollipop treatment. But that doesn’t mean that other non-GPE users like you and I can not get the same update. After all, the only difference between the GPE S4 and the regular Touchwiz S4 are a few partition tables, and the fact that one of them do not come loaded with Touchwiz or Stock Android. A quad core Galaxy S4 from any part of the world with an unlocked bootloader. 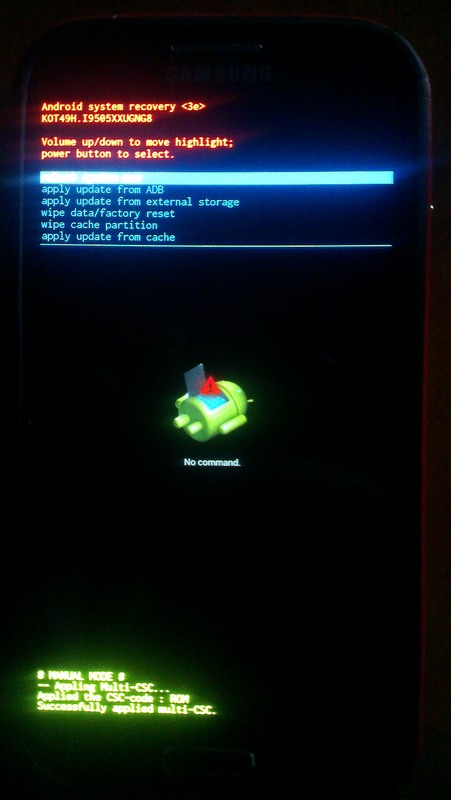 This means any S4 not from AT&T, Verizon USA, or an i9500(the octa core S4 will NOT work) . A USB cable(preferably the original one). More packages, linked throughout the article. First, install the Samsung USB drivers. Double click the file you downloaded previously and install it like a normal application. After you have confirmed it looks like that, turn off your phone. This part is very important and takes some tries. Do everything sequentially. Your phone will reboot. Now disconnect the USB cable, then turn it off again. After it is turned off, use Volume up, home and power button to boot the phone into recovery. Once you see the Samsung logo, let go of all buttons. You will see this. This step is important. Do not touch your phone for the next 10 minutes. If the welcome screen shows up, that’s awesome! Start using it. If it doesn’t show up, simply take the battery out, put it back and turn the phone on. It may take a few tries to finally get to the welcome screen, this is a well known bug among Google’s GPE and Nexus phones. Enjoy your S4 with Android Lollipop 5.0. You now have the official version of Lollipop on your phone and the exact same software that is put into the GPE Galaxy S4 minus OTA updates. Thanks. Worked on my wife’s Canadian S4 and my own T-Mobile USA S4. So to confirm this won’t get any ota updates? No, it won’t receive OTA updates. You are correct. Tried this on my Galaxy S4 SPH-L720T and after I use odin to put TWRP on the phone and reboot into recovery it takes me to the stock recovery… No TWRP….. The SPH-L720T is a different phone internally. It is the tri-band version of S4 with a slightly different CPU. So if I wanted to unroot, would I just have to factory reset my phone? HI i flashed this successfully on my galaxy s4 tmobile variant and tried going to back to stock but that failed. i treid doing it through twrp and then with odin and both failed. i cant get back to recovery mode on the phone and i tried to put twrp back on my s4 with odin and that failed also. Any help especially on this chrsitams day i know its tough but any help to get my phone working again would be of much help as it is my only phone, thanks! I need more details as to what you did to try to get to stock. Getting back to stock is incredibly simple but I need to know what you did first. Thanks. Nice tutorial, just what i was looking for. i can wait to try it on my S4. will this work with the same steps on the S3? No, please don’t try it on anything other than an S4. The steps are vastly different. any thoughts what should i do next? Thats not an error, that just means you are still stuck at stock recovery while you should be at TWRP. Just start the process again as your drivers aren’t properly setup. i did it like 10 times in a row. i will try again. well, 2 hrs later, tried several times on two different computers, with 2 different usb cables….no success. Wow, your phone seems to be really non-functional for custom recoveries unfortunately. That is definitely a phone problem than a recovery problem. The recovery does not affect the system at all after boot. In fact, you can have no recovery installed and still use the phone without a problem.